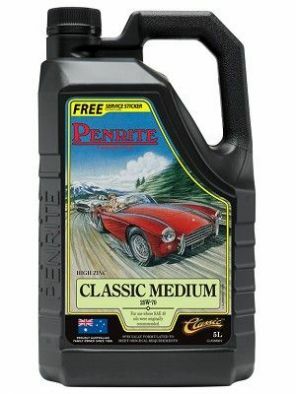 Formerly known as HPR40, Penrite Classic Medium is a 25w70 engine oil formulated for many car engines 1950 - 1979 and many post war motorcycles. Contains a complete additive package and due to the quality of its components will provide improvements in hot oil pressure and oil consumption compared to lighter grades. The Penrite Classic range is specifically made for petrol and diesel engines manufactured between 1950 and 1975. A premium mineral, high zinc, low detergent engine oil designed specifically for petrol and diesel fuelled vehicles manufactured between 1950 and 1989. For use where SAE40 engine oils are recommended. It features a double layer of engine wear protection with high zinc and increased operating temperature viscosity over monograde and older style multigrade oils. Recommended for use in passenger cars, motorcycles, 4WD's, light and heavy duty commercial vehicles that originally specified an SAE40 grade engine oil and were fitted with an engine oil filter. It is ideal in vehicles operating in moderate ambient temperatures or as a summer grade oil if using Classic Light engine oil as a winter grade or if the engine is suffering from excessive oil consumption. Classic Medium contains a "Tacky Additive" so that when the vehicles are laid up, the engine oil doesn't run off the internal surfaces. This combined with an increased level of rust inhibitor, provides protection against corrosion and deterioration when the engine is not used or in storage. It features low detergent levels and contains high zinc levels for added anti-wear protection for older engines.